Online puppy brokers. What you see and what you don’t see. BUYER BEWARE! There are hundreds of websites selling puppies online. In fact, selling puppies online is the new way puppy mills do business. The breeders have various methods of selling their puppies via the internet. Some of the websites are created and managed by the breeders themselves. Other websites are classified ads placed by the breeders through Ebay, Craigslist, Kijiji or local publications. There are also mega web sites selling thousands of puppies in one place that act as “clearing houses” for puppy breeders. We call these websites online puppy brokers. Online puppy brokers provide their clients, the breeders, a ready-made platform and marketplace to sell dogs. They are considered brokers because they facilitate sales through their sites. It’s simple – the breeder opens an account often times for a fee, uploads their photos and contact information and they are in business. Using slick websites, online puppy brokers allow breeders from all over the country to simply create an account and sell puppies. Sites such as Puppy Find, Next Day Pets, Oodle, Terrific Pets, Puppy Trader, Dogsnow, Animaroo, Purebred Breeders, Lancaster Puppies, and many more are good examples of what we call online puppy brokers.These websites act as an agent, in most cases taking a fee to arrange the puppy transaction. These online puppy brokers also make certain that when searching for puppies online the internet search engines find their sites quickly. The online puppy brokers maintain all of the website maintenance and provide beautiful web pages that can dupe consumers into thinking they are buying from a reputable breeder. The puppies are selected, purchased and transported to the consumer without the consumer ever meeting the puppy, the puppy’s parents and without meeting the breeder or seeing the facility where the puppy was born. Simply put, they make it easy for anyone to sell puppies online. These websites provide a vast ready-made marketplace linking buyers looking for puppies with thousands of puppy sellers. 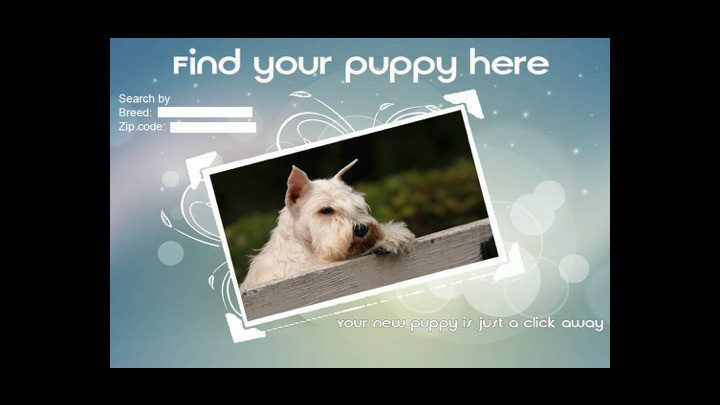 The websites make it easy for any breeder to sell puppies. The sites are fancy and can mislead consumers. It is hard for consumers to identify the truth from the fiction online. The benefits for selling puppies online are numerous. These online sites are good for breeders and brokers but bad for breeding dogs, puppies and consumers. Ironically, these web sites all have disclaimer pages that warn buyers about internet scams and puppy mills. But, they bank on the buyer falling in love with the puppy in the photo and ultimately purchasing the puppy. Most breeders that sell puppies sight unseen over the internet are substandard breeders. To identify the qualities of a reputable breeder visit Pupquest.org. Buying a puppy online is truly a case of BUYER BEWARE!